Practice Java questions and answers for interviews, campus placements, online tests, aptitude tests, quizzes and competitive exams. 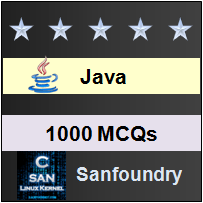 This section of our 1000+ Java MCQs focuses on method overriding in Java Programming Language. 1. Which of this keyword can be used in a subclass to call the constructor of superclass? 2. What is the process of defining a method in a subclass having same name & type signature as a method in its superclass? 3. Which of these keywords can be used to prevent Method overriding? Explanation: To disallow a method from being overridden, specify final as a modifier at the start of its declaration. Methods declared as final cannot be overridden. 4. Which of these is correct way of calling a constructor having no parameters, of superclass A by subclass B? Explanation: Every interface variable is implicitly public static and final. 6. Which of these is supported by method overriding in Java? Explanation: Both x,and y are pointing to the same array. Explanation: class A has been declared final hence it cannot be inherited by any other class. Hence class B does not have member i, giving compilation error. d) The variable first is set to elements. Explanation: The value at the 0th position will be assigned to the variable first. Explanation: r is reference of type A, the program assigns a reference of object obj2 to r and uses that reference to call function display() of class B.
Sanfoundry Global Education & Learning Series – Java Programming Language.